I rid myself of wage-slavery 20 years ago since when my thinking activity and cat-like tendencies have both developed astronomically. I write, paint, teach and compose music. I go long solo distances by motorbike. I garden. I work with people to help them gain a deeper insight for themselves into who they are and what they might do. The 'Enneagram Apprentice' series is for friends who have attended my Enneagram course. It follows up and develops the ideas created by them there. If you're expecting short blogs from me you'll be severely disappointed! Sound bites are enticing or immediately attractive but say very little in the end... The photos are examples of anchors I use for various purposes. 1. The guy standing on the top of the train is asking my constant virtual question, "Where to now?" 2. The motorbike is my symbol of constant movement. 3. The painting is one of many Magic City depictions I've done since 1977. The Magic City of the Mind. 4. My summerhouse I built ten years ago. It's where I 've done my best work! 5. Gurdjieff says make friends with animals - they are more obviously sensitive than human-beings. My cat Hanley and his friend the Tang Dynasty horse (model of an original by my friend Mick Miller... 6. I am a pyromaniac. One should always have bonfires. This one lasted for nine days. 7. 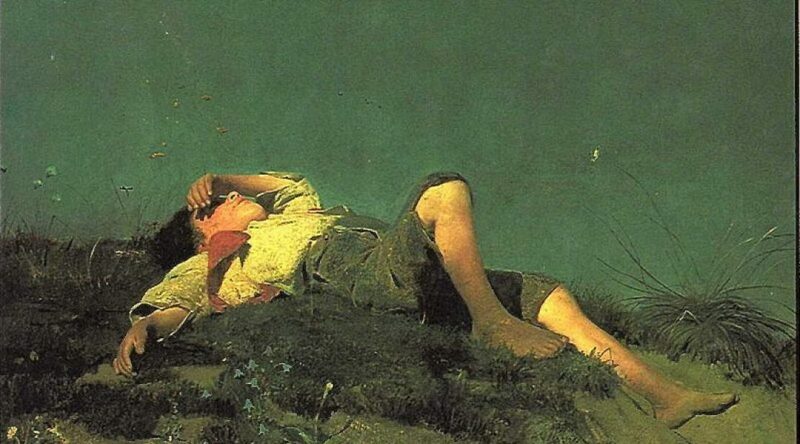 Lenbach's 'The Shepherd Boy'. This was one the wall of a room in the junior school I attended 1945 - 1948. Every Friday one year we went into the room on a Friday afternoon to hear Mr Bullivant read a story. I have no idea what the story was - I wasn't listening but staring at this picture and thinking that this was what life was about and how my life would be. It's the flip side of various insanely active things I've done!